November 2, 2018, Chicago – Sherrie Ashley, a retired special education teacher and current teacher’s aide living in Manteno, Illinois, became the newest Adrian Dominican Associate during the annual Fall Chapter Assembly of the Adrian Dominican Sisters’ Dominican Midwest Mission Chapter, based in Chicago. The assembly was held October 27 at the Mercy Center. The ritual included a brief introduction by Sister Norine Burns, OP, Sherrie’s mentor; Sherrie’s formal acceptance of the call to be known as an Adrian Dominican Associate; the signing of the formal documents of commitment; and Sherrie’s reception of the Adrian Dominican Associates logo. 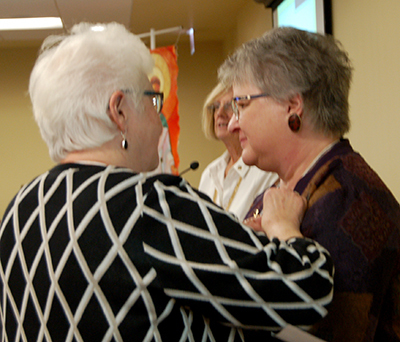 Sister Patricia Siemen, OP, Prioress, pins the Associate logo on Sherrie. While familiar with the Racine Dominican Sisters, Sherrie first became aware of the Adrian Dominican Sisters when one conducted a mission appeal at her parish. She felt the call to live simply and to be compassionate to “those who are disabled, suffering, poor, or dying,” she said. Sherrie is active at her parish, St. Joseph Catholic Church in Manteno, as a catechist, lector, and Eucharistic minister and has been training to be a hospice volunteer. She is also in discernment about becoming a chaplain. A “life-long learner, always studying and reading,” Sherrie holds two master’s degrees: in curriculum/special education and in educational leadership. Sherrie and her husband have two adult children and two grandchildren. They also devote time and energy to a rescue for great danes, and care for the massive dogs when their owners can no longer care for them. Associates are women and men, at least 18 years of age, who make a non-vowed commitment to share in the Mission and Vision of the Adrian Dominican Sisters. While maintaining their independent lifestyle, they participate in ministries and activities of the Adrian Dominican Sisters. For more information on becoming an Associate, contact Mary Lach, Director of Associate Life, at 517-266-3531 or mlach@adriandominicans.org. If you are a single Catholic woman interested in religious life – or know of a young Catholic woman who is – contact Sister Tarianne DeYonker, OP, at 517-266-3532 or tdeyonker@adriandominicans.org or Sister Mariane Fahlman, OP, a 517-266-3537 or mfahlman@adriandominicans.org.